During the January National Board of Directors meeting in Silver Spring, the PTSD & Substance Abuse Committee discussed medical marijuana (cannabis) and the use of its active ingredients, tetrahydrocannabinol (THC) and cannabidiol (CBD), for the treatment of PTSD. THC is the psychoactive chemical that makes you feel “high,” while CBD does not. CBD is said to have potential as a treatment for a wide range of health conditions. An April 2017 National Institute on Drug Abuse (NIDA) publication lists CBD as a treatment option for many medical disorders, such as certain forms of epilepsy, anxiety, sleeping disorders, glaucoma, Alzheimer’s, chronic aches and pains, HIV, multiple sclerosis, and nausea related to other medical treatments including chemotherapy. But it does not include PTSD. Marijuana has been demonized more intensely than many pain-relieving drugs derived from the opium poppy such as morphine. Yet, according to NIDA, every day more than 115 Americans die after overdosing on opioids, while marijuana has no direct link to any overdose deaths. 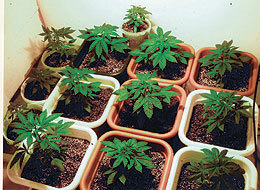 Marijuana is one of the most tightly controlled substances under federal law. The U.S government considers it a Schedule I Controlled Substance. The Drug Enforcement Agency (DEA) claims it does not have any medical value and is worse than heroin and LSD. All this despite the fact that in the United States (as of January 8), thirty states, plus the territories of Guam and Puerto Rico, and the District of Columbia have laws broadly legalizing marijuana in some form. Seventeen other states have more restrictive laws limiting THC content for the purpose of allowing access to products that are rich in cannabidiol (CBD), the non-psychoactive element in cannabis. Eight states and the District of Columbia have adopted the most expansive laws legalizing marijuana for recreational use. In California, sales of recreational-use marijuana kicked off on January 1. In Massachusetts retail sale of cannabis is expected to start in July. So with medical marijuana legal in more than half of the U.S., it’s not surprising that many clinicians are asking about the short- and long-term effects of this drug. Information on the medicinal properties of cannabis is mostly anecdotal. Approval and registration for research is extremely difficult to obtain. Government agencies involved in this process include the DEA, the Food and Drug Administration, and NIDA, which is the sole provider of cannabis for research purposes in the country. Without NIDA’s approval to supply cannabis through a contract with the University of Mississippi for its cultivation, research cannot be carried out as long as there is not another source licensed by the federal government—a circumstance that has been a significant barrier to cannabis research. Compounding the problems in doing valid research is that cannabis provided by NIDA has been criticized as being inferior to that commonly used by medical cannabis patients in states where it is legal. Other criticisms of NIDA-supplied cannabis include large amounts of stems and seeds, high levels of mold and yeast, low THC content, and low diversity of strains. A recent case underscores these criticisms only too well: After significant delays in the application process, two university clinical researchers finally obtained the necessary permits, registrations, and agreements to study the effects of marijuana among veterans with PTSD. They obtained their supply of cannabis from the University of Mississippi, but were forced to cancel the study when the government-supplied marijuana plants were found to be contaminated with lead, pesticides, and herbicides. The PTSD and Substance Abuse Committee has concerns that evidence-based, gold-standard research studies (double-blind, placebo-controlled clinical trials with large populations) have not been conducted with marijuana. The committee cannot advocate for the use of any medication not approved by the FDA—which in 2016 determined that cannabis has “no currently accepted medical use in treatment in the United States”—or not recognized by the National Academies of Medicine (formerly the Institute of Medicine) as a scientific, evidence-based treatment for PTSD. There is a double bind here. Calling for research is the right thing, but the federal government continues to impede honest and rigorous research. In mid-2017 Secretary of Veterans Affairs David Shulkin said that “medical marijuana could help veterans,” and suggested that the VA would look into studying the effects of medical marijuana on veterans in states where it is legal. But that’s on hold now because Attorney General Jeff Sessions recently announced that the Department of Justice will increase federal enforcement actions against marijuana growers, sellers, and buyers, even in states where it is legal. As a result, a VA directive forbids its clinicians to prescribe—or even discuss—marijuana. Veterans deserve the results of evidenced-based research to make informed decisions about their health. Without the rigorous research that enables veterans to make informed decisions, we all become free-range experimental guinea pigs. Tom Berger, Ph.D., is the Executive Director of VVA’s Veterans Health Council. Tom Hall, Ph.D., chairs VVA’s PTSD & Substance Abuse Committee.